Considered the ultimate painting surface for oils, Belgian linen is the highest-quality substrate available for artists who seek a luxurious painting experience and the best archival longevity. 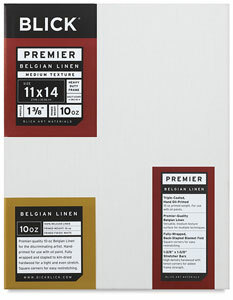 True to its name, Blick Premier Belgian Linen Canvas offers premier quality at an affordable Blick price. We begin with 100% pure, 4.5 oz medium texture linen that's been prepared, picked, and pumiced by hand in Belgium. Using a special technique perfected by the Old Masters, each canvas is then hand-coated in the USA with three applications of an oil-based, lead-free primer to reach a 10 oz primed weight. The linen is then back-stapled to kiln-dried, high-density, North American-grown pine stretcher bars with an impressive 1-3/8" profile. The frame is constructed with tenon corners for added strength, and eight keys are included for minor tension adjustments over time. Blanket-fold corners assure ease of re-stretching. 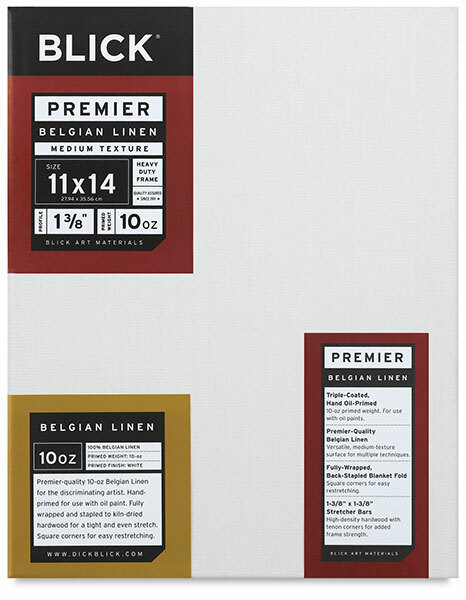 Blick Premier Belgian Linen Canvas is a versatile surface that's ideal for all oil painting techniques. Stretched Canvas Care — Because they are made of natural materials, changes in temperature and humidity may cause stretched canvases to shift or adjust over time. To enhance stability, store them vertically in a climate-controlled space. To view a PDF of Blick Canvas, please click here. These items are subject to special shipping considerations due to size and weight. ® Blick and Blick Studio are registered trademarks.